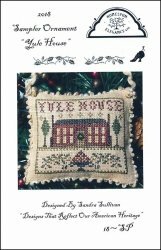 2018 Sampler Ornament: Yule House [D7025] - $7.50 : Yarn Tree, Your wholesale source for cross stitch supplies. Cross stitch pattern by Homespun Elegance. Welcome to "Yule House!" A large Christmas wreath decorates the front door as you enter. Feel the warmth of the fireplace, the smell of the fresh baked cookies & the gorgeous decorated Christmas tree. Have yourself a Merry Christmas! Stitch count is 57w x 46h.